Studio Granda, Reykjavík: The synergy of two award-winning designers and innovative thinkers from Iceland, who create architecture with ’volcanic’ emotions. 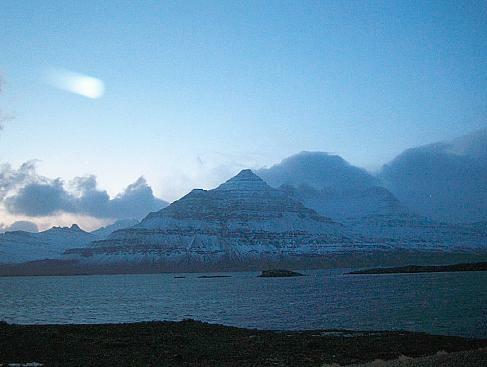 The feeling of Iceland: how a Nordic location and culture can stimulate two authentic talents. 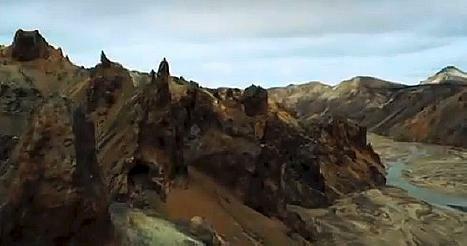 Iceland was formed about 20 million years ago from a series of volcanic eruptions. It long remained one of the world’s largest uninhabited islands. The mediaeval Landnámabók (“The Book of Settlements”) describes how people came to Iceland. It stated that Celtic monks known as the Papar lived in Iceland before the Norse settlers arrived in the 9th and 10th centuries. The first permanent settler in Iceland is generally considered to have been the Norwegian chieftain, Ingólfur Arnarson. He sailed to Iceland in 877, and settled near the site of presentday Reykjavík. The name Reykjavík means “Bay of Smoke” (from Old Norse reykja “to smoke” and vík “bay or cove”), because of the steam rising from the hot springs in the vicinity. Reykjavík is the capital of Iceland today, with a population of 200,000 - more than half of Iceland’s total population of 320,000 inhabitants. Iceland was first a Norwegian and later a Danish colony from 1262 to 1918. It became independent in 1918 and a republic in 1944. Iceland was one of the poorest and least developed countries in the world. The industrialisation of the fisheries made the country much more prosperous, and it was one of the wealthiest countries in the world by the 1990s. Iceland’’s banks were deregulated in 2001 and went on an ill-judged investment spee that led to the collapse of the nation’s three major banks in 2008, nearly plunging the whole country into banktruptcy. The Icelandic banking crisis had repercussions for many foreign investors. Apart from its financial ups and downs, the island is renowned for its beautiful and diverse, unspoilt nature. It is a country of extremes, which prides itself on its moonlight landscapes, waterfalls, glaciers, lava fields, natural lagoons and rainbows - not to forget its volcanoes, some of which are still active. 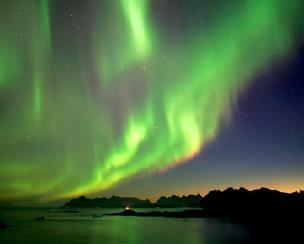 The well-known Northern Lights or Aurora Borealis (photo above), are one of nature’s most spectacular phenomena. Islands are not normally supposed to move - unlike continents, which according to the theory of plate tectonics formed a single land mass about 250 million years ago and have since drifted apart. But Iceland lies right on the junction between two continental plates. The constant lateral displacement and separation of the plates with respect to one another causes the island to move and to grow slightly. In a few million years, it will be several kilometres bigger. And it will get gradually further from Europe and America. These movements also cause material from the earth’s mantle to rise regularly to the sufarce, giving rise to volcanism, geysers and other phenomena such as the earthquakes that people in Iceland experience practically on a daily basis. The interior of the island consists mainly of a plateau covered by sand and lava fields, mountains and glaciers. Iceland is known for its geysers. Geyser, also known as The Great Geyser (photo above), is the most famous geyser in Iceland. It can hurl boiling water up to 70 metres into the air, and is known to have been active for approximately 10,000 years. 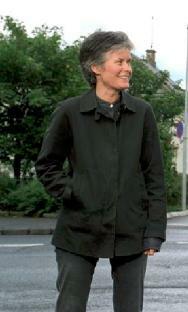 Margrét Harðardóttir, multicultural architect, studied in Edinburgh, London; worked in Paris. 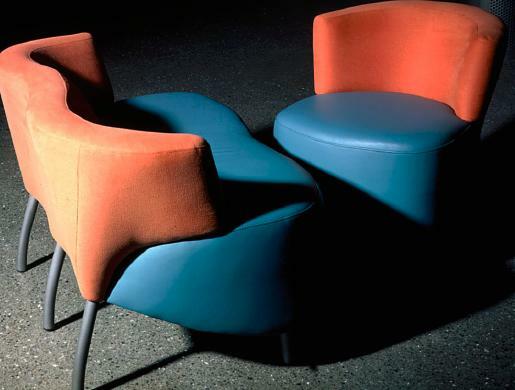 Greatly influenced by the famous architect Högna Sigurðardóttir. Margrét Harðardóttir and Steve Christer established Studio Granda in Reykjavík in 1987 after winning the competition for the desgin of the Reykjavík City Hall. Their practice is commissioned for public and private buildings as well as infrastructure, planning, product design, furniture design and installations in colleaboration with artists. The Ráðhús Reykjavíkur' (Reykjavík's City Hall) is situated in the centre of Reyjavík’s old town, by the Tjörnin, a small lake in central Reyjavík. 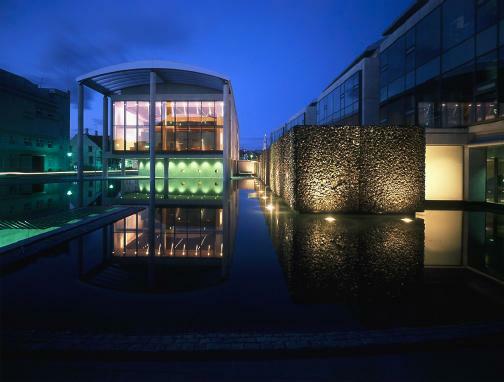 The City Hall houses the offices of the mayor of Reykjavík, a café and a large 3D map of Iceland. Sometimes it is used for art exhibitions. The building was constructed in 1992. Across the lake there are long views to the mountains on the far side of the bay. To the north is the parliament, the cathedral, a commercial centre and a harbour. 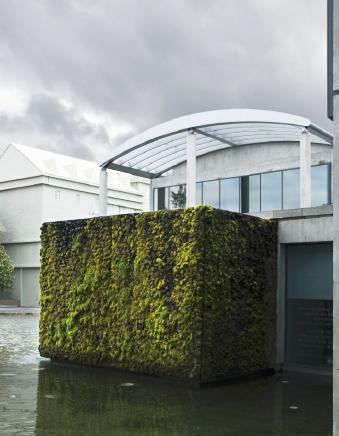 The foundation of the building concept was drawn from the fragile, fragmented nature of the site. By grafting the permanence of the city into the delicate ecology of the lake, an order was established which formed both the new spaces in the city and the internal accommodation. About half of the City Hall is built below ther ground. Steve Christer, an English architect in Reykjavík. Steve greatly admired the magnificent architecture of Oxford buildings as a juvenile. Born: Blackfyne, United Kingdom, 1960 Education: University of Newscastle upon Tyne H.B, Saint (William Bell) Memorial Scholarship, 1981; Architectural Association, 1982-1984 Foundation of Studio Granda with his partner Margrét Harðardóttir, 1987 Tutor ‘Rafha’ architecture worshop . Collaboration with Arkitekthøgskolen in Oslo,1992 Guest professor Berlage Institute, 1994 Unit Master Architectural association, 1994 1995 External examiner Iceland Academy of Arts, 2010 Master class tutor, Bergen, Arkitekt Skole, 2011 Baird Visiting Critic AAP, Cornelll University, in Ithaca, New York state. The commission for this house in Germany was won by Studio Granda in 1989 as a result of the competition “Aktion Poliphile”, initiated by Fritz Küstner of the Galerie z.B. in Frankfurt. “Poliphile” refers to the hero of the fifteenth century allegorical romance “Hypnerotomachia Poliphili,” whose quest for his beloved Polia served as a source of inspiration in formulating the conceptual frame work for the competition. 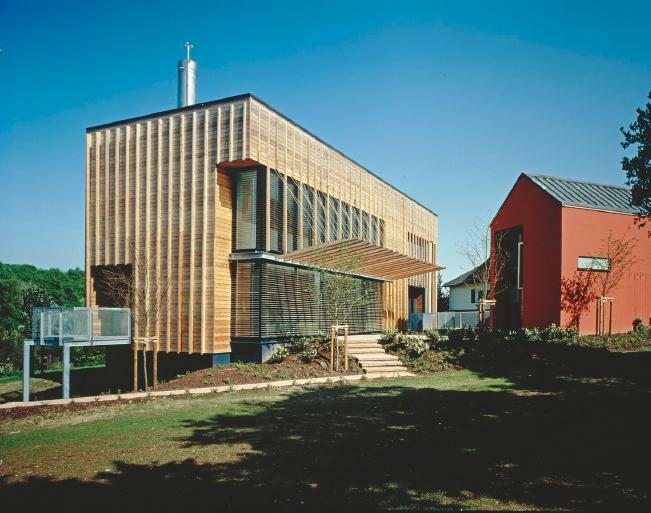 The project is composed of two houses, which rise from the arable lands of north Wiesbaden (Germany), the House of Saturn and the House of Delia. Saturn symbolises the idea that time creates and then destroys it’s creation. He is the bridge between the op posites of his own being, a symbol of life’s fallibility. His descendant delia, the caste goddess of youth, energy and health epitomises our modern times. Her dark side, prudently well hidden, is reflecting the old gloomy, sluggish side of her neighbour, Saturn. Rotating about a south facing court the two houses form a private planetary system. Saturn is solid and impenetrable, his roof is made of lead and the walls are of a deep red render. Towards the street the house is windowless and featureless with the exception of an arced cut in the flank wall. Derived from the forests to the north, Delia settles lightly upon the extended hand of her ancestor. Her walls are of sunbleached cedar, which in response to orientation are cut by glass walls, swept up into a canopy, pucnhed out as windows or, as in the east, left fallow. 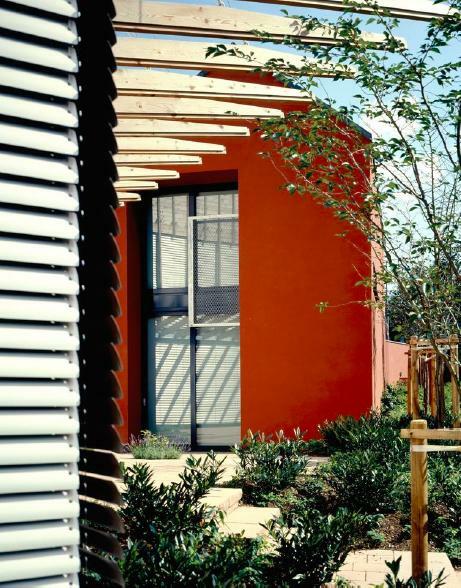 Here the vertical strips which regulate the facades, twist from north to south. This sublte gesture, which is revealed by the rising sun, emphasizes Delia’s impermanence, and in doing so underwrites her tension with Saturn. 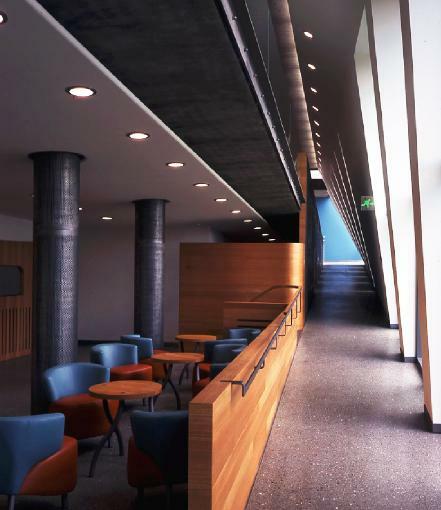 The New Art Museum of Reykjavík, refashioned by Steve Christer Margrét Harðardóttir of Studio Granda, occupies two floors of the south wing and three floors of the north wing of a concrete warehouse built about an open court between 1933-1939. At the turn of the twentieth century. The main pier in Reykjavík, Iceland’s umbilical cord to the world, occupied the site. This link is reawakened in the Art Museum. Externally the building is predominantly painted ‘Fishery Protection Vessel’ grey with the museum demarcated in white (photo top right). A concrete canopy marks the entrance and new windows either contain hermetically sealed doors or allow glimpses into the south gallery. Internally the canopy reflects light into the double height lobby which is one of a series of spaces, lined with hot rolled steel sheets and black walnut floors, which collectively form the ’pier’ link. Flanking the lobby is the raw concrete museum shop and reception with white and walnut furnishings. Cloakrooms are contained within a crystalline glass box. Bisected by the pier the court is split into a large external exhibition space and a small multipurpose room, each with white concrete floors. A skylight box illuminates the pier and at night it’s glow fills the court. The pier is terminated on the north façade by two huge glass panes on the ground and first floors. These openings serve the library and café. The six galleries share a common pallet of concrete and white but placement, form and scale give each one a distinctive character. Delivery, workshop and storage are all located on ther ground floor and accessed from the harbour side. The Reykjavík Art Museum, marked by a striking entrance canope. Vogaskoli school Reykjavík - The Vogaskoli primary and secondary school (photo below), was built in Reykjavík in 1958. In 1975 a new building was added to Vogaskoli. 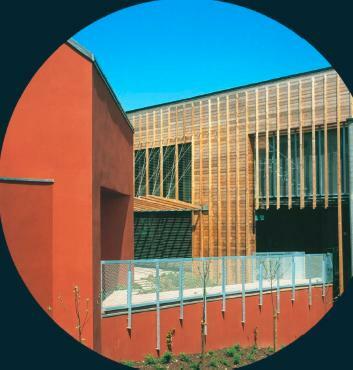 In 2004 as a result of a new increase in the number of of students, the ciry decided to demolish the 1975 building and build a new extension, based on the principles of ‘open schooling’. 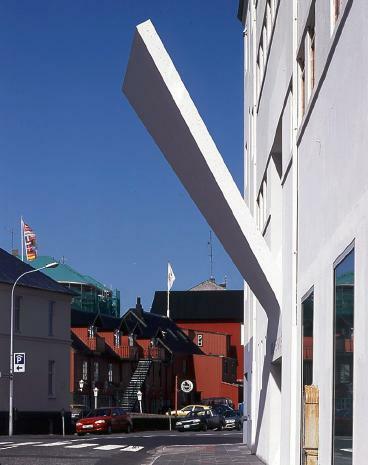 The building was designed by Studio Granda, commissioned by the City of Reykjavík. 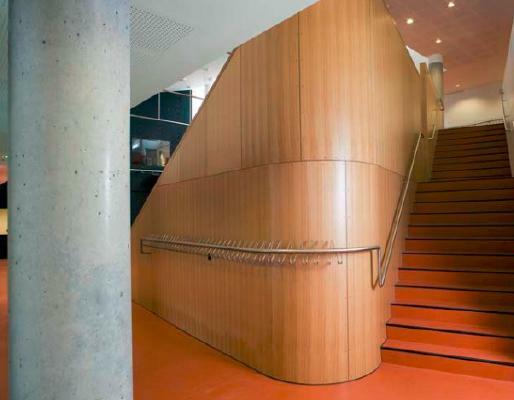 The main task for the architects was to redesign the building to a higher standard within an exceptionally tight cost constraint. It probably was one of, if not, the cheapest schools ever built in Iceland. The materials are: exposed insitu concrete and an off-the-shelf glazing system from Denmark and a grass roof. Internally, walls are predominately of glass or gypsum with oak fittings, ceilings of gypsum and acousitc panels and floors of linoleum and carpet. The heart of the building receives additional daylight through the clearstory windows in the hall. Iceland Pavilion by Studio Granda, for the New Nordic Architecture & Identitiy Exhibition, 2012, Louisiana Museum of Modern Art, Denmark. Reykjavik was established as a trading place in the late 18 th century, until then it was a farm. The historic corner house at the main square of Reykjavík consist of three houses. The first house, constructed of timber logs with moss wadding, was built in 1801. The corner house was constructed in 1852. The third house, a cinema known as Nýja Bíó, was built in 1918. It was designed in a more worldly fashion with a curved façade in a style reminiscent of Jugendstil. Architects from three firms Studio Granda, Argos and Gullinsnið won the compettion to rebuild the Historic Corner of Reykjavík. The design for the Supreme Court of Iceland was won in an open competition in 1993 by Studio Granda. Construction commenced in the autumn of 1994 and the building was finished in (1996). 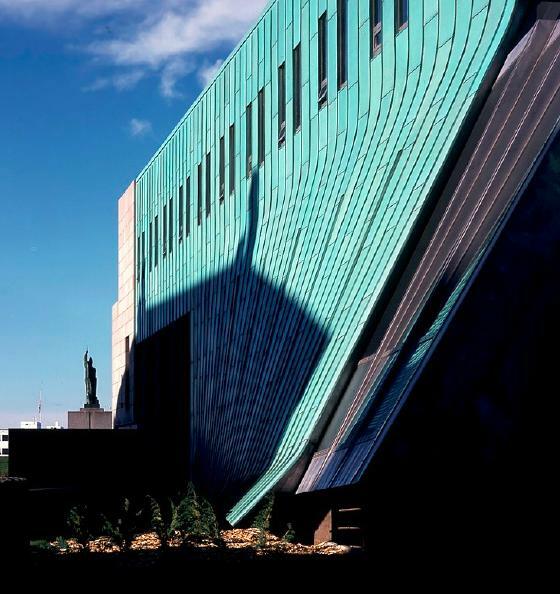 The new building for the Icelandic Supreme Court is located on a low hill in the centre of Reykjavík. Next ot the building is a car park, demarcated by roads on three sides and to the south by the classical national library building. At to the north of the street line we find the state ministries building, Arnarhváll, and to the east is the National Theatre with is dominant black flytower. An open grassed area lies to the west, opening the site to the Atlantic Ocean. The buiding is highest and widest at its western end achieving a scale and proportion in harmony with the flanking Arnarhváll and the library building. The form is pulled and twisted both by the gravitational forces of the surrouding buildings and the pressures of the enclosed spaces, so that it is gradually reduced in height and width towards the teatre building. The eastern end is terminated by a lower, roofplanted block which overlooks a small square at the rear part of the teatre. 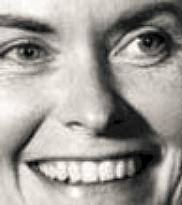 One of the great icons of Icelandic architecture is Högna Sigurðardóttir (born 1929, in Vestmannaeyjar). 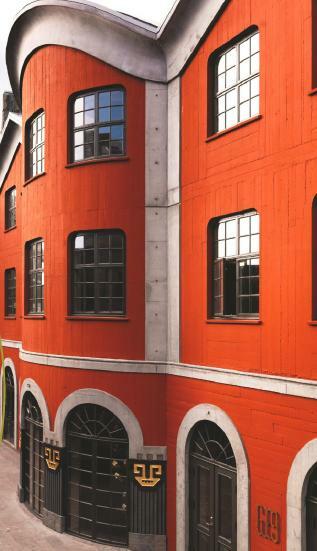 In 1949 Högna Sigurðardóttir became the first Icelander to study architecture at the École des Beaux Arts in Paris. Shortly after graduating in 1960, she designed a residential building in the Western Islands, so becoming the first woman to have designed a building in Iceland. She went on to build residential buildings in Reyjavík and Kópavogur, installing furniture of her own design and adding gardens on the roofs. What kind of architecture is to be found in a country that has no traditional building materials such as timber, and bricks, but instead builds houses using grass, and clay? To what height can concrete buildings soar in a country that experiences almost every day an earthquake? The exhibition ”Iceland and Architecture?” opened on 23 November 2012 in Berlin, also organised in Frankfurt am Main, tried to explore these questions. One of the speakers in the panel discussion was Petúr Hrafn Ármansson, an authority on Icedanlic architecture, whose counsel is sought by many people in Iceland and abroad. 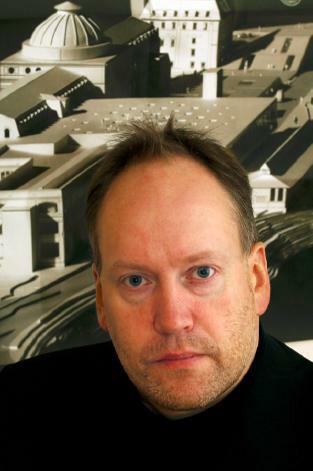 Petúr Ármannsson, born in 1961 in Iceland, lives ans works in Reykjavík as an architect, researcher and author. 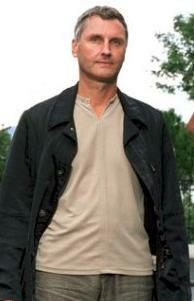 Ármansson studied architecture at the University of Toronto, Ontario, Canada. He worked at Helgadottir and Palsson architects in ReykJavík from 1990 to 1993 and was the Director of of the Architecture Department of the Reykjavík Art Museum from 1993 to 2006. He started working at Glama-Kim Architects in Reykjavik in 2006 and still works there. 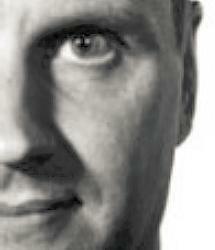 He wrote an introductory article to catalogue of the German Festival “Iceland and Architecture?”, which was enttiled “The Mountains are Their Castles.” Together with Halldora Arnardóttir he wrote a monograph on the well-known Manfred Vilhjálmsson, one of the most famous Icelandic architects. Petúr Ármannsson also wrote an article entitled “Social Aspects and Modern Architecture in Iceland,” an article publised in the book “Modern movement Scandinavia, Vision and Reality.” Manfreð Vilhjálmsson (born in 1928) is the “grand old man” of Icelandic architecture. He has practiced architecture in Iceland for over fifty years, creating a diverse body of work of great artistic integrity. 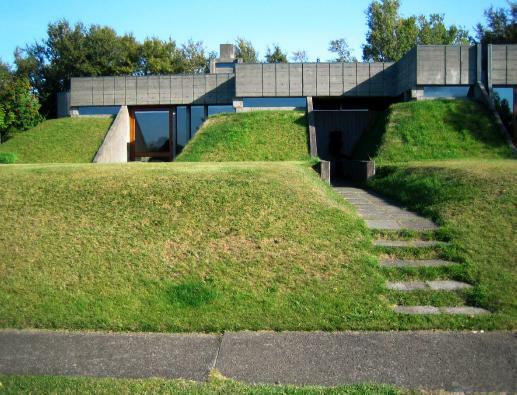 After completing architectural studies in Gothenburg, Sweden in 1954, Vilhjálmsson worked in office of Skarphédinn Jóhannsson in Reykjavík, before establishing a private practice. 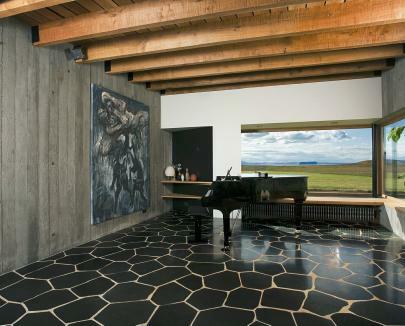 In the late 1950´s, he was instrumental in introducing new spatial and structural concepts in Icelandic architecture.